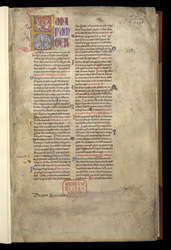 Gratian, who lectured in Bologna, has been called 'the true founder of the science of Canon Law', because in the mid-12th century he wrote the first successful attempt to bring together and reconcile papal decrees which seemed to be contradictory, and to elucidate the general principles on which Canon Law was based. His pupil Omnibonus compiled an abbreviated version soon after. This copy of Omnibonus's text was in the library at Rochester Cathedral in the early 13th century, and it was very possibly written there. The start of the text is marked by an illuminated initial 'H' with painted and penwork decoration. A two-line Rochester ownership inscription in the lower margin has mostly been erased, but has been read with an ultra-violet lamp.